The Cordillera del Cóndor (Condor Mountain Range) is an isolated branch of the Cordillera Real Oriental (Eastern Mountain Range), which reaches an altitude of nearly 3,000 m.a.s.l. in the region. The Cenepa River or Senep, as referred to by members of the Awajún and Wampís peoples, in whose territory the Cordillera is located, flows from its peaks. The Cordillera del Cóndor has attracted the attention of biologists and environmental scholars due to its geological characteristics and the particularity of its vegetation, in addition to being the only representative sample of the Montane Forest of the Cordillera Real Oriental. “Tepui” type formations, which are actually characteristic of the Guiana Shield, are found in this area, a Pleistocene refuge of the Marañón River. Tepuis are plateaus with vertical walls, where sandstone soils and a high concentration of vascular plants are predominant. In 1996, the area was identified as a “priority zone for the conservation of national biodiversity” in the document entitled “Diversidad biológica del Perú – Zonas prioritarias para su conservación” (Biological Diversity of Peru – Priority Zones for its Conservation) prepared by the National Institute of Natural Resources (INRENA). 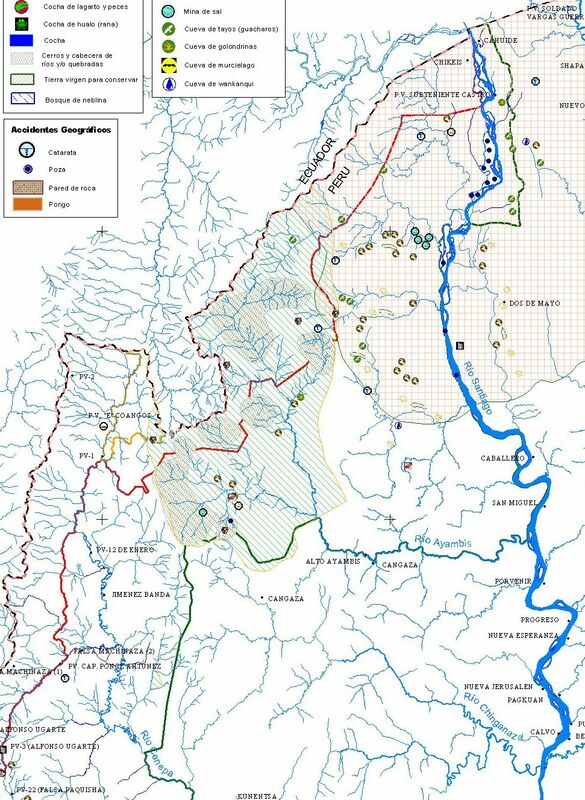 The particularity of the area, its status as a “hotspot” and its role in the water cycle of the Cenepa River Basin substantiate the importance to protect and conserve this ecosystem. The Cordillera del Cóndor also forms part of a section of the international border between Peru and Ecuador. This stretch of border between both countries was tardily delimited after the war of 1941 and the signing of the Rio de Janeiro Protocol of 1942. The Cordillera del Cóndor also marks the border historically negotiated between the traditional land of the Shuar and Awajún indigenous peoples located on the northern and southern flanks, respectively. Both populations form part of the Jivaro culture and language family. The Shuar, which constitute one of the indigenous nationalities of the Republic of Ecuador, have a population of approximately 110,000 people distributed among more than 500 centers, located in the Provinces of Morona Santiago, Zamora-Chinchipe and Pastaza. The headwaters of several basins of great importance to the Marañón-Amazonas river system, considered to be vital for existence in the indigenous territories along the Peru-Ecuador border, are found in the region of the Cordillera del Cóndor (Condor Mountain Range). The Nangaritza River originates on the northwestern side of the border and forms the Santiago River that also receives several tributaries from the southwestern side thereof. The Comaina, Sawientsa and Numpatkeim rivers, which emanate from the same flank, flow toward the Cenepa River, the headwaters of which are composed of an array of numerous streams that descend from the peaks of the Cordillera del Cóndor. The enormous value of biodiversity in the Cordillera del Cóndor is largely associated with its geological origin and the isolated nature of this sub-Andean mountain range. The Cordillera is mostly comprised of Tertiary and Mesozoic sediments consisting of sandstone and limestone, resulting from the erosion of the old Guiana and Brazilian Shields. These sediments were deposited on the western side of the South American continent during the Mesozoic and early Tertiary periods, before the Andes rose up and folded, concurrently emerging with the Cordillera Andina (Andean Mountain Range) starting in the Miocene epoch (25 million years) and the late Pliocene epoch in the last 4 to 5 million years. In the Cordillera del Cóndor, the sedimentary strata extend from the early Jurassic formation, with limestone and volcanic intercalations, to the Tena formation of the Paleocene and early Eocene epochs, formed by red clay. At the same time, the Hollin sandstone formation, deposited as a result of the erosion of the Guiana Shield, forms a layer of no more than 150 meters dating back to the Cretaceous period, but which mostly emerged in the last 10 million years. This very complex geological history is responsible for the existence of intrusive igneous formations that contain deposits of gold, copper and other minerals, as well as the so-called Zamora granitic batholiths, which is the result of major volcanic and tectonic events in the Jurassic period that injected extremely large granite plutons and huge volcanic masses at various levels. The Cordillera del Cóndor, like other sub-Andean mountain ranges, is among the world’s most diverse areas in biological terms. Studies conducted by different institutions and scientific projects carried out in the Cordillera have revealed an unexpected bio-geographic connection between it and the Guiana Shield. This is reflected in the existence of plateaus or isolated “tepui”-type sandstone mountains and the presence of a significant number of vascular plant genera in the Cordillera del Cóndor, possibly the largest concentration of vascular plant species, genera considered to be disjunct from those found in Guyana. These plateaus occur in fragments of varying size and altitude, variables that also affect the density and height of the vegetation found in these areas. Mount Kumpaná or Kumpaná Muja is one of these tepuis that present an extraordinary diversity of flora and some fauna. Due to these important characteristics, researchers have stated that the Cordillera del Cóndor could have the richest flora of any area of similar size anywhere in the Neotropic. Studies conducted by the Missouri Botanical Garden in connection with Peruvian and Ecuadorian scientific institutions documented 1,900 vascular species, 300 to 400 bryophytes and a considerable number of new species to science as of 2007. The combination of diverse geological substrata and forest humidity throughout the entire year make the Cordillera del Cóndor a very unique place, where seventeen different types of vegetation with significant ecological variability have been distinguished. Biodiversity studies exhibit numerous “noteworthy records”, due to the rarity of the species found, the existence of new species, the breadth of range, threatened species or the importance of species for conservation. The rare insectivorous plant, Drosera sp., has been identified in the exposed sandstone formations of the high Comaina River. Tropical Premontane Rainforest, Tropical Wet Forest and Tropical Premontane Wet Forest predominate in the Cordillera del Cóndor. The zone has an annual rainfall of 3,000 mm, reaching 4,000 mm in the foothills of the Cordillera with an average annual temperature of 25 ºC. Tropical Premontane Rainforest covers the left bank of the Cenepa River and the eastern portion of the Cordillera del Cóndor. It is located between 600 and 700 m.a.s.l. Tropical Montane Rainforest can be found in the peaks of the Cordillera del Cóndor above 2,000 m.a.s.l. ; the climate is typically rainy and semi-warm. In the upper reaches of the Cordillera del Cóndor, between 1,700 m.a.s.l. and 2,900 m.a.s.l., the vegetation does not exceed 15 meters in height, due to the strong winds and shallow soils over limestone, particularly in the so-called transitory cloud forests at the edge of the hills. In spite of this, scholars have found species pertaining to eighty-three families (145 genera, 228 different species) in the high forest of the Cenepa River Basin. Although large game species are not abundantly found in the middle and lower Cenepa River Basin, a wealth of species was identified in the Cordillera del Cóndor and upper Cenepa and Comaina river basins, in comparison with similar habitats of equal altitudinal location. It is worth noting the presence of some endangered and vulnerable species, amounting to a total of nineteen species of mammals in different categories of threat. In terms of birds, five new species have been found in Peru. A significant number of day and night lepidopteran species, including a new species to science, has also been recorded. Furthermore, various endemic tree frog species have been documented in the Cordillera del Cóndor. A wealth of species was discovered in areas consisting of clear and black waters, as well as lentic environments, which were found to be in good condition when conducting the studies, given that variations in ichthyofauna are associated with altitude. The studies detected a considerable presence of otters, which reflected the abundance of fish in the upper reaches of the Cenepa river basins and their tributaries. The network of rivers, streams and brooks makes its way through the deeply dissected mountain system. 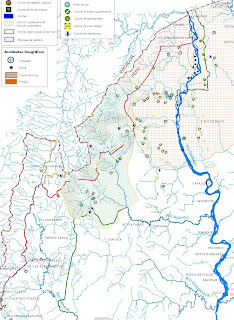 Water originating in the Cordillera del Cóndor constitutes a fundamental part of the subsystems of the Cenepa and Santiago river basins, which also contribute significant volumes of water and sediment to the Marañón River. Due to the limestone and sandstone structure, the presence of these formations and the vast network of rivers and streams, hundreds of culturally significant waterfalls are found in the region. These formations also create caves of great importance for speleology and the local population. These caves, within which you can walk for days, are accessed by long, narrow “chimneys” measuring 60 to 80 meters deep. Nests built by guácharos, more commonly referred to as oilbirds, are found in these caves, which were previously used as secondary burial sites, given that the Jivaro peoples believed that these locations were linked to their ancestors. Due to these characteristics and conditions, the Cordillera del Cóndor is a site of great value for conservation, given the importance of the existence of the sub-Andean mountain range featuring geological and biological characteristics considered to be enormously relevant for research, the Amazon Basin and the continent, as well as its role in maintaining the water cycles inherent to the Cenepa and Santiago river basins. This is a point of encounter, where conservation interests from a global perspective, interests associated with the national conservation strategy and the conservation priorities of the Awajún and Wampís communities in Peru and the Shuar people in Ecuador coincide. Thus, having established the conditions for the final demarcation of the border along the Cordillera del Cóndor, the idea to create a protected area with the purpose of conserving the significant biodiversity and contributing to the stability and security of the border was reconsidered. This process began with intensive participation of the Awajun and Wampis communities but was betrayed by the Government as we have show (see: “Our war against Ugkaju”). © Text excerpted from the Research Report "A Chronicle of Deception" by Research Team of ODECOFROC. All rights reserved.